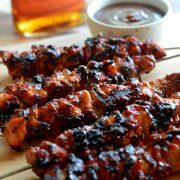 So Morgan over at Host the Toast blog just shared this Bacon Bourbon BBQ Chicken Kebabs recipe and frankly I am speechless! I just cannot wait to make this over the weekend and hope you are as excited as we are! Bacon Paste sounds… eh… interesting to say the least, I know. When I first read about it, I imagined it coming out of a squeeze bottle and spread on toast, or something like that. But don’t worry, that is not the case! Instead, to make Bacon Paste, we combine bacon and a bunch of our favorite spices in a food processor and then spread that stuff all over some chicken thighs before grilling them up. It’s even better than you’re imagining. No, really. 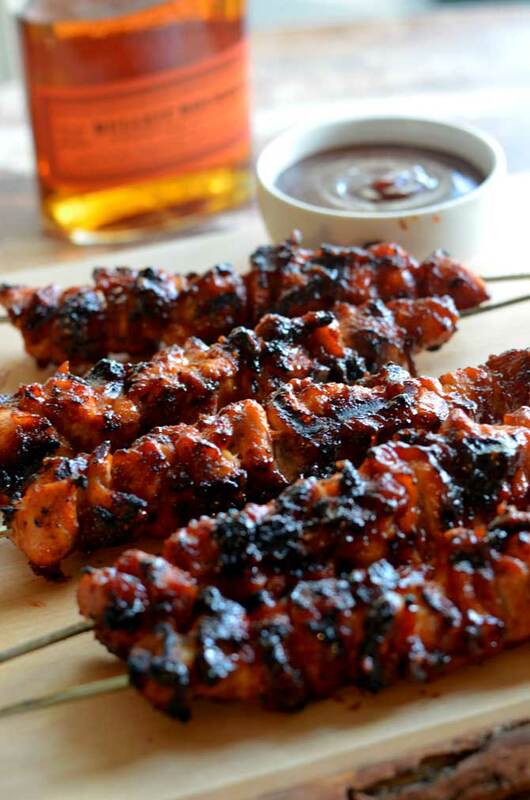 The bacon adds so much flavor and juiciness to the chicken, and when topped off with a little bourbon-infused barbecue sauce, there’s nothing better. My family demands that I make these again– not just once, but all summer long– because they are that good. They won’t have to ask me twice. I think these kebabs would be perfect for Memorial Day, Father’s Day, Fourth of July… any holiday where you can grill… pool parties… graduation parties… Mondays… I mean just make up reasons to make these if you have to. You need to try them. In a food processor, combine the kosher salt, white pepper, onion powder, paprika, dark brown sugar, smoked paprika, and bacon. Pulse until completely smooth.